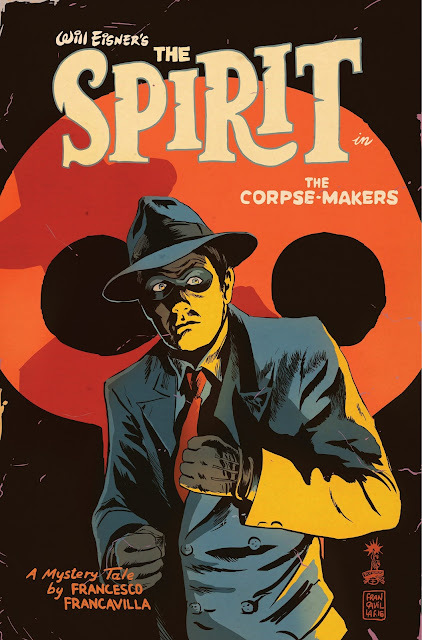 Dynamite Entertainment announces that writer-artist Francesco Francavilla (Black Beetle) will tackle Will Eisner's legendary masked crimefighter this January in the all-new comic book series, The Spirit: The Corpse-Makers! Following Matt Wagner's initial twelve-issue run (released as a collection, entitled Will Eisner's The Spirit Returns, this month), Francesco Francavilla takes the reins for an all-new series early next year! Francavilla, known primarily for his incredible covers and interior artwork, will handle writing and artistic duties on a new series which is sure to please lovers of crime comics, pulp fiction, and -- of course -- longtime fans of Eisner's most well-known creation! "I couldn't be more honored and humbled to have been asked to do a story with one of the icons of the comic universe," says Francesco Francavilla. "I'm not going to lie -- tackling one of Maestro Will Eisner's most famous creations and following in the steps of my dearest friends Darwyn Cooke and Matt Wagner is not gonna be an easy task, but I'll make sure my love for the character, for those legendary creators, and for the medium will show. And I hope readers will be along with me on this new ride. Thanks again to the Eisner Estate and Dynamite Comics for inviting me to Central City; I think I'm gonna like living here for a bit!" "We have been very fortunate to have Francesco lend his talent to such stunning cover art on multiple titles over the years," says Dynamite CEO and Publisher Nick Barrucci. "He is a true master of the pulp style in every sense, and to have him tackle The Spirit? That is something every comic book fan will want to see!" "Francesco Francavilla is part of Dynamite's very DNA," says Joseph Rybandt, Executive Editor. "From his first interior work with us back on Zorro, to the multitude of covers he's done for us over the years - each better than the last - he is one of our go-to artists and he always makes time for us in his increasingly busy schedule. To have him not only write, but draw (and do covers!) The Spirit for five issues? A glorious proposition!" The Spirit: The Corpse-Makers #1 will be solicited in Diamond Comic Distributors' August 2016 Previews catalog, the premier source of merchandise for the comic book specialty market, and slated for release in October. Comic book fans are encouraged to reserve copies of The Spirit with their local comic book retailers. The Spirit: The Corpse-Makers will also be available for individual customer purchase through digital platforms courtesy of Comixology, Dynamite Digital, iVerse, and Dark Horse Digital.